Meet the McGrath family! Mom Narelle is handling dinnertime solo while her husband, Richard, is out of the country for a few months. We checked in to see how mealtimes are going. Narelle and Richard McGrath, of Sydney, Australia. The McGraths have four kids, ages 15, 13, 10 and 10. 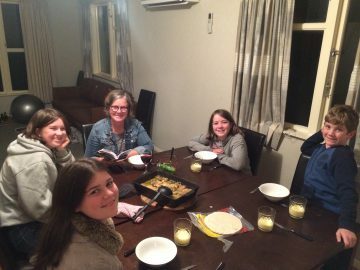 With dad Richard away for several months, Narelle has a simple goal: To consistently gather the family for meals every night and promote togetherness at dinnertime, even when it feels stressful. Like many families we’ve learned from over the years, the McGraths struggle to balance the desire to eat dinner together against the lures of conflicting activities for the kids and the temptation of screen time. When it’s not the schedule that competes with meals in the McGrath household, it’s the kids’ desire to watch television rather than hang out together at the table that can be frustrating for Narelle. While she’s managing dinnertime on her own, Narelle has implemented a few key strategies to make family meals less stressful and more rewarding for everyone. First, she says, she gives the kids a hand in the preparations by having them cook the meal or set the table in a special way. Secondly, she ensures that staying at the table together is a meaningful experience by choosing a book to read together. Currently the family is preparing for a big move to New Zealand, so Narelle has chosen a biography that’s based in New Zealand for their dinner table read-aloud. Favorite meals in the McGrath household include lasagna, barbecue and rice paper rolls. Narelle says that connecting with The Family Dinner Project has been helpful in reminding her that “What I’m already doing is okay…even if some days it feels pretty raw.” She also finds that the games and conversation starters can be an inspiration to lighten the mood at the table on evenings when getting there has been more of a struggle than usual. We wish the McGraths the best of luck in their upcoming move, and hope to hear more from this family as they establish dinners in their new home!